(FOX News) CAPE CANAVERAL, Florida — A NASA astronaut earlier ordered released on bail Tuesday after being slapped with attempted kidnapping charges later was charged with attempted first-degree murder. A reporter with FOX affiliate WFOL in Orlando, Fla., said a jail spokesman said that Lisa Marie Nowak will now not be released from prison. Before the attempted murder charges were added, Nowak was charged with attempting to kidnap a romantic rival for a space shuttle pilot's affections, and was told to wear a tracking device and not to contact her alleged victim. Orange County Judge Mike Murphy said Nowak, 43, would be released on $15,500 bond. She said "yes" when Murphy asked her if she understood not to contact the other woman. Nowak stood in a jail uniform, usually with her head facing down during the hearing. She planned to return home to Houston once released. Nowak is a married mother of three and police believe she was in a love triangle with a fellow astronaut. She faces charges including attempted kidnapping, attempted vehicle burglary with battery, destruction of evidence and battery. Police said she drove 900 miles, donned a disguise and was armed with a BB gun and pepper spray Monday when she confronted a woman she believed was a competitor for the affections of Navy Cmdr. William Oefelein. Nowak and Oefelein, 41, were both first-time fliers during separate shuttle missions last year. They trained together but never flew together. Two other astronauts attended the court hearing. Steve Lindsey, the commander of Nowak's Discovery flight last July, testified that Nowak would obey the conditions of her release. Chris Ferguson, a pilot on the mission, also attended the hearing. When asked about Nowak's behavior after the hearing, Ferguson responded "perplexed is the word I'm sticking with." Nowak told police that her relationship with Oefelein was "more than a working relationship but less than a romantic relationship," according to an arrest affidavit. Police found a love letter to Oefelein in her car. According to authorities, Nowak believed another woman, Colleen Shipman, was romantically involved with Oefelein. When Nowak found out Shipman was flying to Orlando from Houston, Nowak decided to confront her early Monday, according to the arrest affidavit. 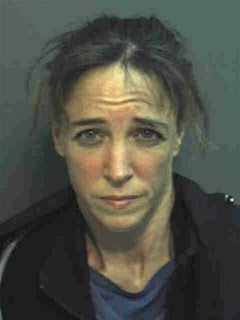 Nowak raced from Houston to Orlando wearing diapers in the car so she wouldn't have to stop to go to the bathroom, authorities said. Astronauts wear diapers during launch and re-entry. Dressed in a wig and a trench coat, she waited for Shipman's plane to land and then boarded the same airport shuttle bus Shipman took to get to her car, police said. Shipman told police she noticed someone following her, hurried inside the car and locked the doors, according to the arrest affidavit. Nowak rapped on the window, tried to open the car door and asked for a ride. Shipman refused but rolled down the car window a few inches when Nowak started crying. Nowak then sprayed a chemical into Shipman's car, the affidavit said. Shipman drove to the parking lot booth and police were called. An officer reported following Nowak and watching her throw away a bag containing the wig and BB gun. Police also found a steel mallet, a 4-inch folding knife, rubber tubing, $600 and garbage bags inside a bag Nowak was carrying when she was arrested, authorities said. Oefelein and Shipman, who the Houston Chronicle said worked at Patrick Air Force Base near the Kennedy Space Center, did not immediately return calls seeking comment. NASA spokesman James Hartsfield in Houston said that, as of Monday, Nowak's status with the astronaut corps remained unchanged. "What will happen beyond that, I will not speculate," he said. Hartsfield said he couldn't recall the last time an astronaut was arrested and said there were no rules against fraternizing among astronauts. Police said Nowak told them that she only wanted to scare Shipman into talking to her about her relationship with Oefelein and didn't want to harm her physically. "If you were just going to talk to someone, I don't know that you would need a wig, a trench coat, an air cartridge BB gun and pepper spray," said Orlando police Sgt. Barbara Jones. "It's just really a very sad case." According to NASA's official biography, Nowak is a Naval Academy graduate who has a master's degree in aeronautical engineering. She has a teenage son and younger twin girls. Oefelein has two children and began his aviation career as a teenager flying floatplanes in Alaska, according to a NASA biography. He studied electrical engineering at Oregon State University and later earned a master's degree in aviation systems at the University of Tennessee Space Institute. He has been an astronaut since 1998.